In close collaboration with our team here at Rosemont Media, New Jersey plastic surgeon Paul J. LoVerme, MD, FACS recently upgraded his practice’s website to not only keep pace with the ever-changing digital age, but also to improve the visual and educational experience his visitors encounter when conducting online research about cosmetic enhancement. Having already established strong brand awareness in his community, the look and feel of Dr. LoVerme’s new responsive website design is essentially a modernized version of his old site accented by gender-neutral colors that reflect the decor of his office as well as a subtle, leafy background that represents the natural-looking results he his known to achieve. In addition to a comprehensive span of procedural details, the website hosts a number of informative videos highlighting surgical and Medical Spa treatments, Dr. LoVerme’s media appearances, practice information, and much more. These educative clips can be found on specific procedural pages as well as in the site’s organized cosmetic surgery video library. To further enhance the educational process, before-and-after photographs and patient testimonials (in both video and written form) are readily accessible, providing prospective individuals with a better idea of what to expect from their procedure of interest. Behind the scenes, all components of Dr. LoVerme’s website are outfitted with advanced plastic surgery search engine optimization (SEO) strategies to help improve his rankings and visibility within his online marketplace. This includes optimization of his content, videos, overall design, and more. 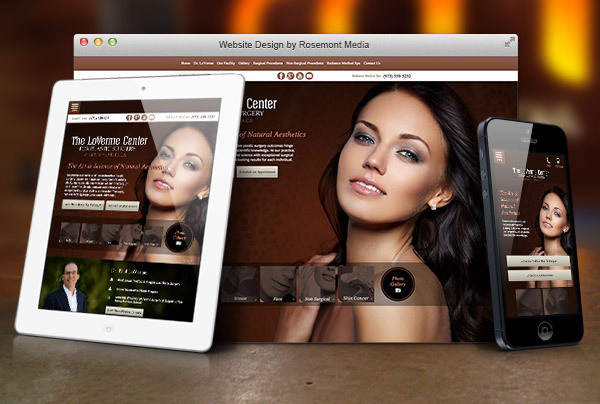 To view the kind of customized site Rosemont Media can help design, build, and maintain for your plastic surgery practice, visit www.lovermecenter.com.